Thai Green Curry Hummus, a unique hummus recipe this is such a charming recipe that once you've tried it I am pretty sure your taste buds will demand again and again. The combination of tangy, spicy and sweet flavours are an adventure for your senses and will leave you happy. The tang of kaffir lime leaves and lime juice, sweetly creaminess of coconut milk and spicy kick of green chilies and heavenly fragrance of this dish, all one in a bowl, happiness for your taste buds, belly, and the soul. 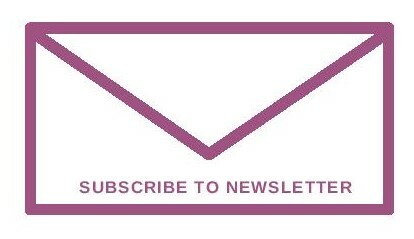 While kids were at home for their 4 weeks holiday, certainly there were a couple of things on the rota, one is catching up with the box set and preparing copious dishes for hungry kids - breakfasts, lunch, dinners, and snacks. A hummus is one of our favourite snack items when it comes to a healthy option. 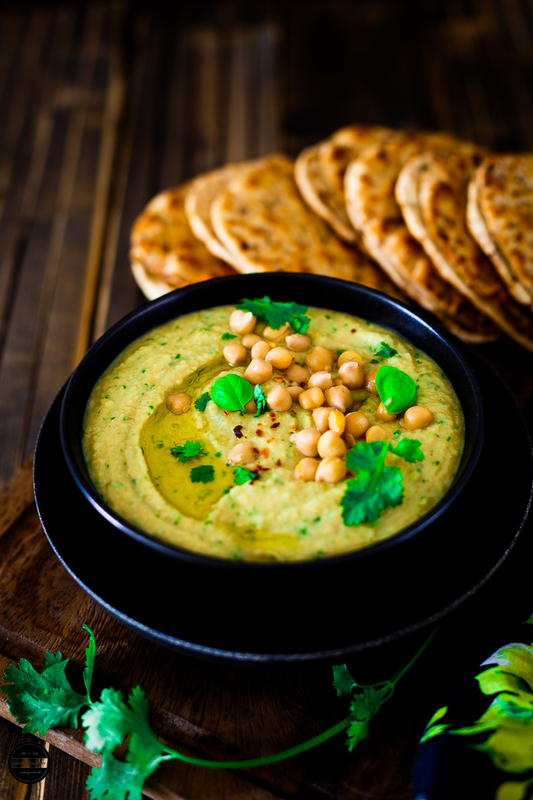 We have demolished many delicious and interesting hummus recipes in the past, be it a sumac hummus , Baingan Bhartha (roasted aubergine spicy) hummus or roasted garlic hummus and this time Thai inspired hummus was on the table to savor. We love hummus,now and then I like to prepare a small batch of it - delicious, healthy, easy and quick recipe and versatile, Not just only for as dip but it can be used as a hearty-healthy sandwich spread, pour it as salad dressing or stir in a hot pasta or noodle bowl, whatever way you use it you're going to have a good meal out of it. Hummus is one dish which I love to prepare as it is a very customised dish, where you can add different seasonal ingredients and make your own or take a small inspiration from the other cultures and create a fusion recipe as long as you stick to base of chick peas, lime/lemon, and garlic, then add any substitution. 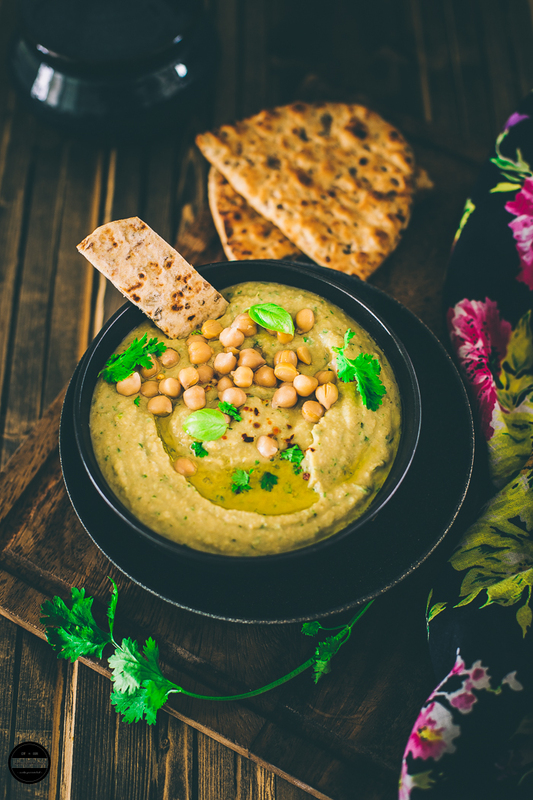 In this recipe, regular hummus is infused with a Thai green curry paste. I have used coconut milk instead of tahini and some basil leaves. Thai Green Curry Hummus turned out fabulous! 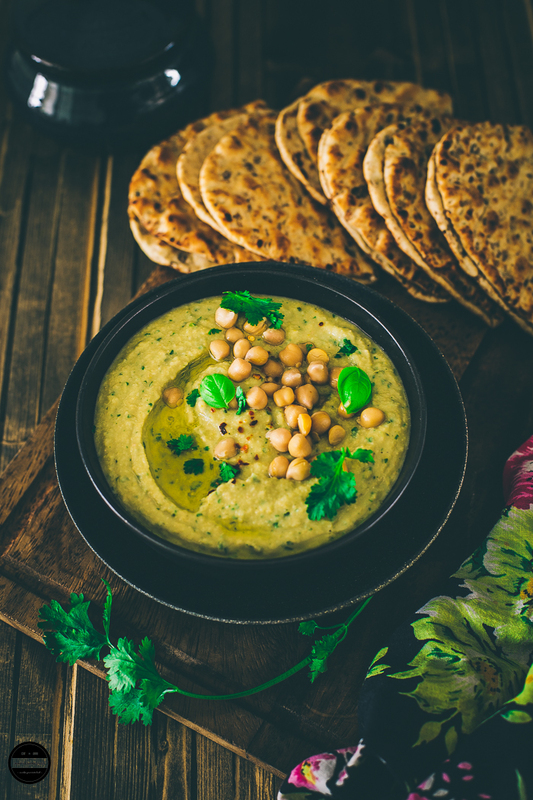 Thai Green Curry Hummus - in this recipe regular hummus is infused with a Thai green curry paste, coconut milk, and basil leaves.Little creamier, sweeter, spicy and tangy at the same time. Great with toasted pitta bread, crackers or vegetable crudites. Place everything in a blender except coconut oil and blend until you get a nice smooth paste.Transfer to a bowl. garnish it with basil, coriander leaves, and coconut oil.Serve and enjoy! This looks absolutely incredible! Super stunning! My Dad doesn't like hummus, but you've added such interesting flavors to this, I'd like to give it a try with him! Yum! Such outstanding flavors! I love that beautiful green color. Wow! I love the substitution of the coconut milk for the tahini! I would have never thought of that! Yum those chickpeas look amazing! Your photos are gorgeous. Love your pictures! The green Thai curry hummus looks so tempting. I have tried red curry hummus..it tastes great. I have a tough time getting anyone around me to eat hummus, but you really put together some fantastic flavors with this version. With football season starting, I like to entertain and host parties. I can't wait to try this hummas with a thai twist, yum! OMG this looks amazing!! I love hummus, curry and anything Thai - right up my alley! I was against hummus for a long time and now that I stat to enjoy it, I cant get enough. Its a great idea that, you added thai green chilies. 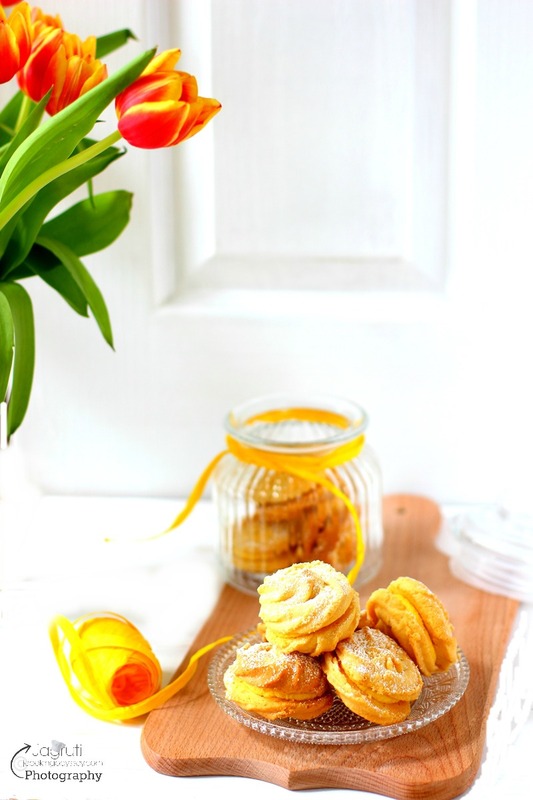 Obsessed with this recipe and can't wait to make it over the weekend. Just hoping Hurricane Irma doesn't bother us too much. I am so trying this. You have two of my favorite cuisines blended together. This sounds so yum. This is a unique hummus! Curry is one of my favorite foods and this dish look and sounds AMAZING! Love the photos and the colors. Beautiful! This is interesting with the touch of cococnut milk. Looks amazing! That is definitely a very interesting variation of the traditional hummus, and that color is just to die for! It's a nice change to use Thai green curry paste. So simple too. Love all the flavors that go into it! Ooh this looks delicious! We were literally just saying yesterday that we haven't had Thai for ages, I think I will give this a try over the weekend! Love Hummus, this looks delicious and would try this! I absolutely LOVE hummus, but have never thought of combining these flavours before! Definitely trying this as I love both green thai curry and hummus. 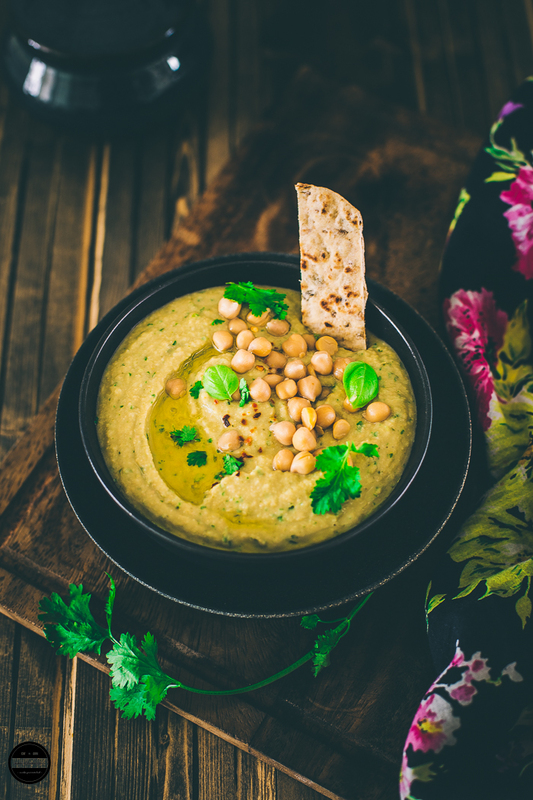 This Thai Green Curry Hummus sounds and looks delicious! I guess I will have to give it a try. I think my hubby will love it. Oh I'm definitely going to try this. I absolutely love hummus. I'm a totally thai food addict so this sounds and looks just what me and my family would all like. I'm not usually a big fan of hummus but this sounds and looks amazing! And your food photography is always so stunning! That looks absolutely and utterly fantastic! I need to try this recipe and SOON! What gorgeous photos! I've recently fallen in love with curry paste (both red and green). I can't wait ttry this out! I don't love cilantro, but I could double up the basil and I'm sure I'd love this! Looks great. What a clever take on hummus! Love all the flavors!